^ LEE, M. S. Y. 1995. Historical burden in systematics and the interrelationships of ‘parareptiles’. Biological Reviews, 70, 459–547. ^ LEE, M. S. Y. 1997. Pareiasaur phylogeny and the origin of turtles. Zoological Journal of the Linnean Society, 120, 197–280. ^ deBRAGA, M. and RIEPPEL, O. 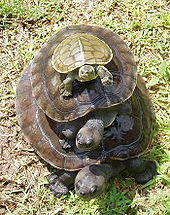 (1997), Reptile phylogeny and the interrelationships of turtles. Zoological Journal of the Linnean Society, 120: 281–354. ^ HEDGES, S. B. and POLING, L. 1999 A molecular phylogeny of reptiles. Science, 283, 898–901. ^ Nagashima, Hiroshi; Shigehiro Kuraku, Katsuhisa Uchida, Yoshie Kawashima Ohya, Yuichi Narita and Shigeru Kuratani (May 2007). “On the carapacial ridge in turtle embryos: its developmental origin, function and the chelonian body plan”. Development (134): 2219-2226. doi:10.1242. http://dev.biologists.org/cgi/content/abstract/134/12/2219. ^ Gaffney and MEEKER, L. J. 1983. Skull morphology of the oldest turtles: a preliminary description of Proganochelys quenstedti. Journal of Vertebrate Paleontology, 3, 25–28. ^ a b c P.M. Datta; P. Manna , S.C. Ghosh & D. P. Das (Nov 2003). “The First Jurassic turtle from India”. Palaeontology 43 (1): 99 - 109. doi:10.1111/1475-4983.00120. http://www3.interscience.wiley.com/cgi-bin/fulltext/119037378/PDFSTART. ^ FRAAS, E. 1913. Proterochersis, eine Pleurodire Schildkrote aus dem Keuper. Jahreschefte des Vereins fur Vaterladische Naturkunde in Wu¨rttemberg, 79, 13–30. ^ Hirayama, Ren; Donald B. Brinkman, and Igor G. Danilov (2000). “DISTRIBUTION AND BIOGEOGRAPHY OF NON-MARINE CRETACEOUS TURTLES”. Russian Journal of Herpetology 7 (3): 181 - 198.